is heart-centered for he believed that true communion takes place in the very depths of our hearts where God dwells and where we dwell in God. 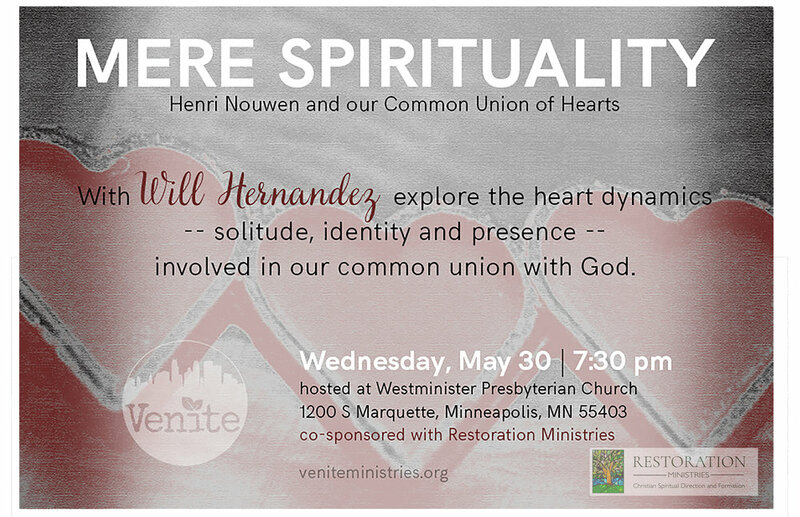 This presentation focuses on the three heart dynamics involved in our common union with God: solitude, identity, and presence---requiring our cultivation of an intimate, centered, and attentive heart respectively---all of which are interrelated and must be integrated in our deepening experience of God. Wil Hernandez, PhD, Obl. OSB, is the founder and president of CenterQuest – an ecumenical hub for the study and practice of Christian spirituality (www.CQCenterQuest.org). A trained counselor, spiritual director and retreat leader, he regularly conducts retreats, workshops, and courses all across the U.S. and abroad focusing on the spirituality of Henri Nouwen whose spiritual legacy he is committed to propagate. Wil is the author of a trilogy on Nouwen and maintains a website dedicated to his work: www.nouwenlegacy.com. No admission fee, a free will offering will be taken.